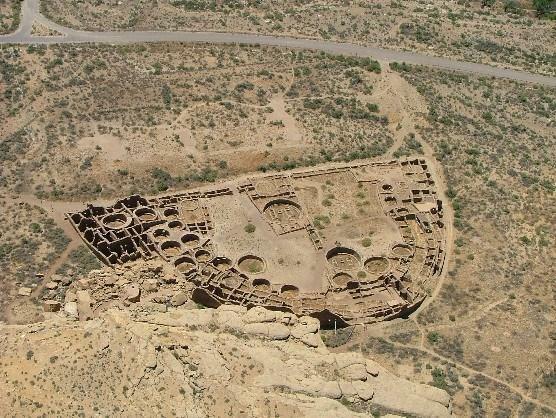 Chaco Canyon bears evidence of a civilization that flourished between 9000 BC and 1300 AD. Chaco Canyon National Park is located in northwestern New Mexico. The area is open to the public to learn about the people who lived within the walls of Chaco Canyon thousands of years ago. In 9000 BC, the area was occupied by Paleo Indians and Archaic peoples. It was then occupied by Ancestral Puebloans from 1 AD to 1300 AD. Between 750 and 850 AD, much of the population of the central San Juan Basin moved to the Four Corners area, north of the San Juan River. Over 1.5 million artifacts have been documented from Chaco Canyon. In the middle of the New Mexico desert, Chaco Canyon housed hundreds of prehistoric peoples. Chaco Canyon was pre-planned rather than annexed; the roads were laid out in straight lines and astronomical orientation would have necessitated a certain amount of planning, skill, and leadership. People lived in the canyon in eleven “great houses”, each one of them big enough to provide homes for an entire village. Inside the great houses, there are approximately 1,133 rooms, and the average size of 1,133 rooms at Chacoan buildings is 11. 97 meters squared. Chaco Canyon is evidence of a civilization that flourished between the ninth century BC and thirteenth century AD and attained remarkable achievements in architecture, agriculture, social complexity, engineering, astronomy, and economic organization. 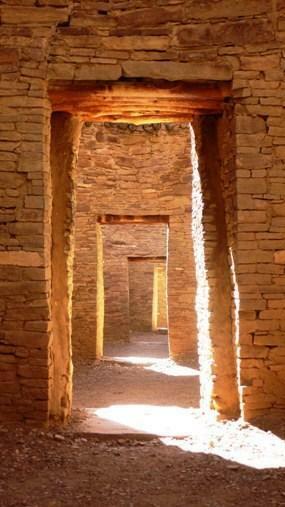 Doorways at Pueblo Bonito ~ Source: Chamberlain, Tanya Ortega de, from the National Parks Service. "Chaco Culture: Pueblo Bonito," available at https://www.nps.gov/chcu/planyourvisit/pueblo-bonito.htm. Aerial photo of Pueblo Bonito ~ Source: Shattuck, Brad, from the National Parks Service. “Chaco Culture: Pueblo Bonito,” available at https://www.nps.gov/chcu/planyourvisit/pueblo-bonito.htm. Erin Tapahe, Brigham Young University, “Chaco Canyon Overview,” Intermountain Histories, accessed April 19, 2019, https://www.intermountainhistories.org/items/show/187. Lekson, Stephen H. Architecture of Chaco Canyon, New Mexico. 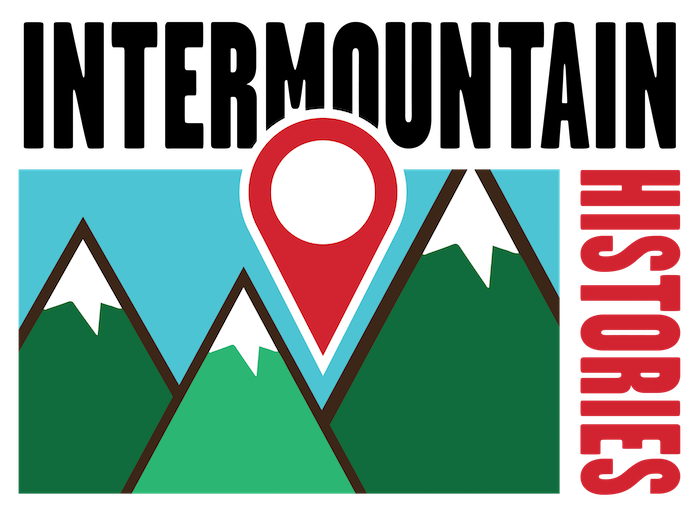 Salt Lake City, UT: University of Utah Press, 2007. Gabriel, Kathryn. Roads to Center Place: A Cultural Atlas of Chaco Canyon and the Anasazi. Boulder, CO: Johnson Books, 1991. From the National Park Service. “Significance of the Park,” available at https://www.nps.gov/chcu/learn/historyculture/significance-of-the-park.htm. Vivian, R. Gwinn, and Margaret Jean Anderson. Chaco Canyon. Oxford, England: Oxford University Press, 2002.